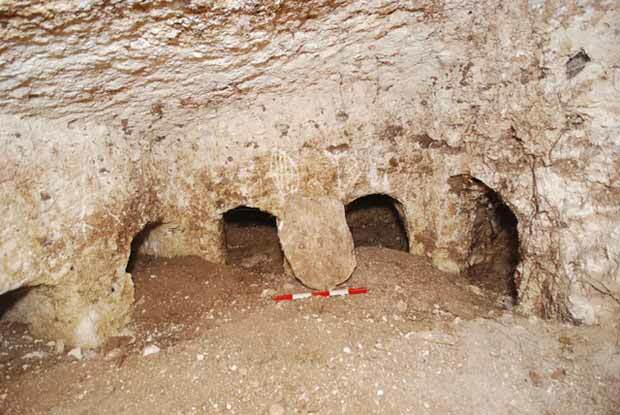 In October 2013, a burial cave dating to the Second Temple period was documented (Permit No. A-6979/2013-03; map ref. 196030/639308) after a grove burned down at Horbat Haratim. 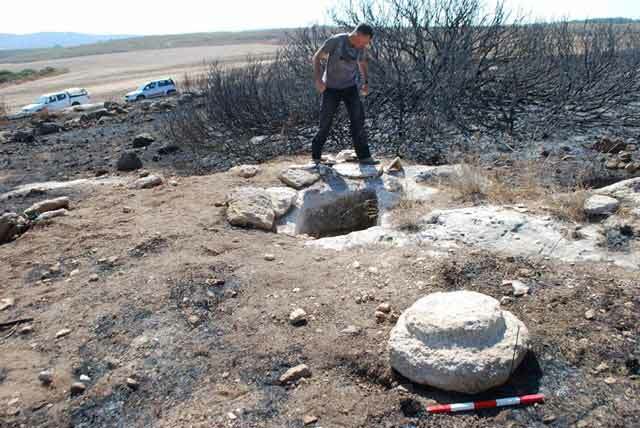 The documentation was carried out by E. Klein and U. Rotstein, inspectors of the Unit for the Prevention of Antiquities Robbery, on behalf of the Israel Antiquities Authority. The entrance to the burial cave was identified in the wake of a fire north of Horbat Haritim in the Ayalon Valley. 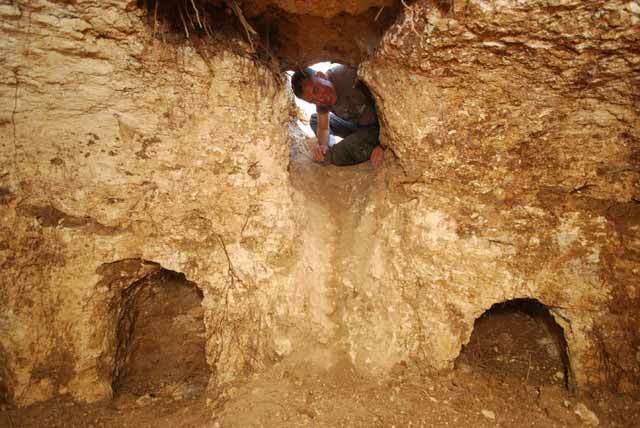 The cave is situated in the hills that border the Ayalon Valley from the west, on one of the spurs descending from east of Mizpe Beko‘a and c. 1.5 km north of Kibbutz Nahshon. It was plundered in the past by antiquities robbers who breached its opening. The cave entrance is in the center of a moderate spur that descends south from Spot Height 172, c. 0.5 km north of Horbat Haritim and next to an offshoot of Nahal Nahshon, one of the main tributaries of Nahal Ayalon, which flows east of the site. 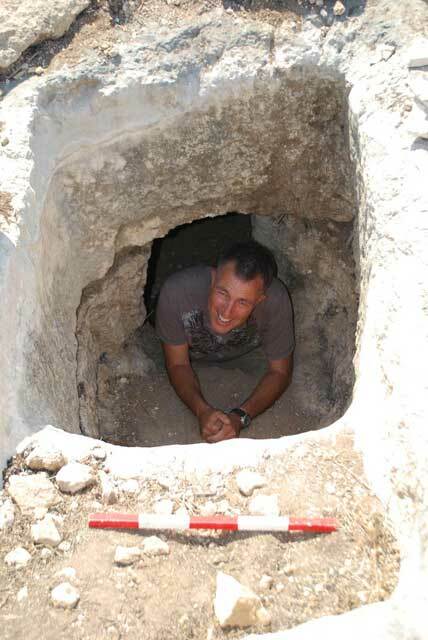 Horbat Haritim was surveyed as part of the British Survey of Western Palestine, which recorded building foundations, rock-cut caves, several hewn water cisterns and the remains of an olive press (Conder and Kitchener 1883:127, 287). The Arabic name of the site—Kh. Umm Haretein, meaning “the ruin of the two small mounds”—was also mentioned in that survey (Stewardson 1888:121). The burial cave was hewn in bedrock and contained nine loculi (Fig. 1). Its opening was hewn in the southern side of a rectangular shaft (length 0.8 m, width 0.6 m), at a depth of c. 1.0–1.5 m. The opening (width 0.4 m, height 0.65 m) had a rectangular frame to accommodate a roll-stone (Fig. 2). The round (diam. c. 0.65 m) and tapered stone was discovered c. 3 m outside the cave opening (Fig. 3). 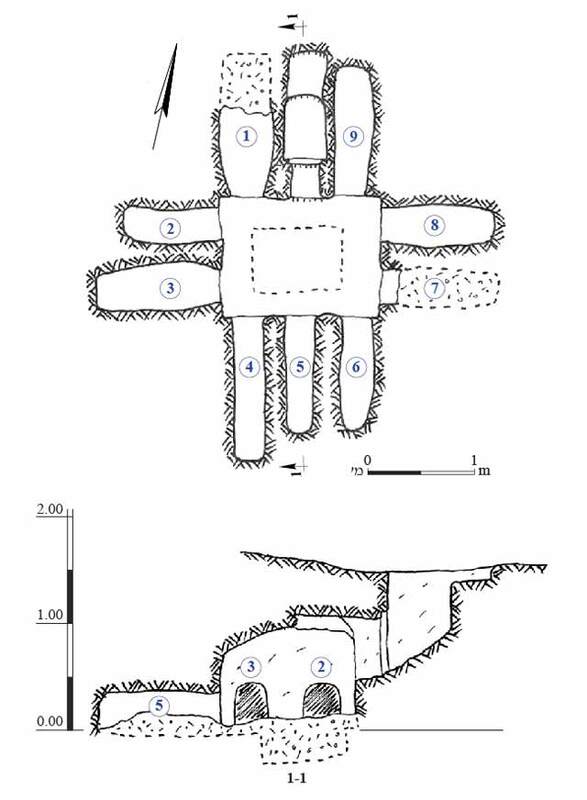 The opening of the cave led to a central burial chamber whose floor was covered with alluvium c. 0.5 m below the level of the entrance (Fig. 4). Loculi (average length 1.5–1.8 m) were installed in the walls of the cave, two in each of the burial chamber’s northern, western and eastern walls and three in its southern wall. The loculi were covered with coarsely dressed slabs of indigenous limestone. One of the closing slabs was discovered leaning against the southern wall (Fig. 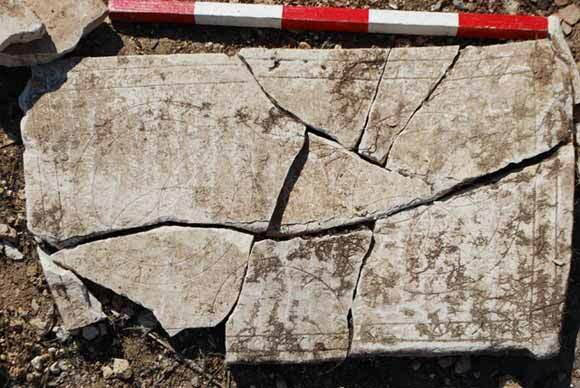 5) and other closing slabs were found lying outside the cave, next to its opening. Fragments of at least one ossuary were found inside the cave, near the entrance to the cave and c. 2 m away from the entrance. The wall of one of the ossuaries was adorned with two incised compass-made rosette patterns surrounded by a frame (Fig. 6). The architectural characteristics of the burial cave—the opening and its stepped frame, the roll-stone, loculi and closing slabs—are common in many tombs that have been documented in the necropolis of Jerusalem from the end of the Second Temple period (Kloner and Zissu 2003). The ossuary fragments substantiate the assumption that the cave was hewn for burial in the time between the late Second Temple period and the Bar Kokhba Revolt and was used by residents of the Jewish community in the area, perhaps from nearby Horbat Haratim. Artifacts indicating that the area was inhabited by Jews at the end of the Second Temple period were discovered in several nearby sites, particularly Tel Gezer, Horbat Gader and Horbat Sharisha (Kloner 1976; Peterson-Solimani, Solimani and Weiss 2001). Conder C.R. and Kitchener H.H. 1883. The Survey of Western Palestine: Memoirs of the Topography, Orography, Hydrography and Archaeology. London. Kloner A. 1976. Horbat Sharisha. HA­ 57–58:27 (Hebrew). Peterson-Solimani M., Solimani G. and Weiss D. 2001. Horbat Gader. HA-ESI 113:73*–74*. Stewardson H.C. 1888. The Survey of Western Palestine: A General Index. London. 2. The rectangular shaft and the opening of the cave and its hewn frame, looking south. 3. The entrance to the cave with the roll-stone in front of it and the closing slabs alongside it, looking south. 4. The northern wall of the central burial chamber whence the cave was entered, flanked by Loculi 1 and 9, looking north. 5. The western wall of the burial chamber and the loculi. Note the closing slab, looking west. 6. The side of an ossuary decorated with two incised rosette patterns.